Hit NBC drama Parenthood debuted on DVD on Aug. 31, 2010, from Universal Studios Home Entertainment. The TV show, from producers Ron Howard, Brian Grazer and Jason Katins, follows the trials and tribulations of three-generations of the Braverman family. Parenthood stars Peter Krause (TV’s Six Feet Under), Lauren Graham (TV’s Gilmore Girls), Dax Shepard (When in Rome), Erika Christensen (Traffic) and Monica Potter (Saw). The first season of the show was contained in a three-DVD set. 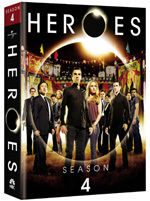 Earlier that month, the end of NBC’s Heroes arrived on DVD and Blu-ray. About ordinary people with extraordinary powers, the science-fiction television series stars Hayden Panettiere (I Love You Beth Cooper), Milo Ventimiglia (Armored), Ali Larter (Obsessed) and Zachary Quinto (Star Trek). On Aug. 3, Universal bowed Heroes: Season 4 in a five-disc set with plenty of special features.